King | The Life and Comedy of Graham Kennedy - I.M.T. 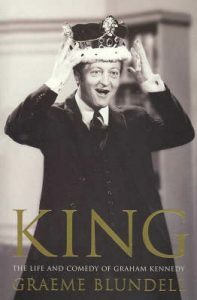 Graham Kennedy, Australia’s King of Comedy, reigned over local television for 40 years as talk-show host, game-show presenter, satirist, commentator, and iconoclastic jester. This book is an engaging portrait – written with an incisive insider’s eye – of the man who transformed Australian comedy. So, here it is, Graeme Blundell’s famous Kennedy project. As anyone with even a passing acquaintance with the affable author can tell you, it’s been a long time brewing. There’s probably not a soul over 40 in television who hasn’t been approached at some stage with a “pssst – got anything on Graham?”. Not bad stuff, any stuff – and you have to give it to Blundell for persistence. He got stuff, 424 pages of it. The result is a book both impressive, for sheer volume and love of subject, and frustrating, in that it goes round and around the times and the comedy and the cities and the technology and the anecdotes but you never hear the voice you’re most interested in, that of Kennedy himself. Lots of quotes from old interviews, lots of commentary but the central mystery of the boy who became a star (who went “straight from school uniform to wearing the cap and bells”, as one friend put it) before withdrawing into silence and solitude, remains unsolved. It’s such an irresistible story, the counterpoint to the rock star or actor who blazes early, rages hard and dies young. We love that story because it feels inevitable. What happened to Graham Kennedy – whatever exactly did happen inside that buzzing brain that reduced him to such a sad and angry wraith – has the same epic element, leaving one to ponder the essentially extractive nature of television which, taken in overdose, destroys the thing it loves. In the last couple of pages, writer Tony Sattler reports a conversation during which the ailing Kennedy says: “I’ve been thinking I should never have done 13 years of IMT (In Melbourne Tonight).” Another friend reports his vehemently agreeing with the remark: “You run out of guts. There is only so much to use.” It fits with the sense you get, looking at Kennedy’s career trajectory, of a man hollowed out by his years on air. He talked and he talked and no amount of money or adulation, or the increasing extravagance of his changing rooms, could fill the void. One other person could have thrown light, because he travelled in parallel during the early years yet escaped the same fate – Bert Newton. But he proved elusive too, politely refusing Blundell an interview. No wonder the book took so long. Still, if this biography can’t tell us what went wrong with Kennedy, it certainly gives us chapter and verse of what went right. Blundell is trained in history and recounts in detail Kennedy’s rise and early triumph, first in radio then television. He reproduces many skits verbatim (some of which, to be frank, don’t seem as funny on the page as they clearly were on the night) and his commentary on Kennedy’s comedy is a strong point: the roots in vaudeville and slapstick, the blend of script and ad lib, the way he played on and with the everyday experiences of his suburban Melbourne audience. Strange, when you consider how abnormal his own life was. From the day he walked into a studio – on March 31, 1957, a pale and scrawny 23 – he was a creature of the box. It consumed him. When Kennedy went on his first holiday overseas, he took a camera with him and sent back reports. Everything he did and said was for public consumption; the book is laced with references to his unknowability, the chasm from the start between the private man and the performer. “He was so private that sometimes he was like a cut-off man,” another friend says. This is the myth, of course, but it also seems to be the truth. He drank and partied and won his first Logie by 24. He did some terrible shows as well as great ones and retired more often than Dame Nellie, yet he remained work-obsessed, sexually ambiguous (Blundell gives the topic of homosexuality a wide berth though drops the odd hint) and emotionally disconnected – a man permanently gripped by red-light fever. The strength of King, then, rests not in its revelations about the Kennedy psyche but what it has to say about live television – how it works and what it can do to people. These really were the good old days: the electricity of the studio, the harried nobodies behind the scenes propping up the stars, the dropped cue cards and the nightly mayhem. Blundell evokes the frenzy of television’s dawn, down to the fashion for back necklines so a viewer, who would be seen from the rear, could look chic while watching her favourite program. Which was, of course, IMT. For someone like me, born into the late ’50s in Melbourne, the names are as familiar as the Pokemon characters are to today’s kids. Joff Ellen and Ernie Carroll, Toni Lamond and Noel Ferrier, Panda and Happy Hammond (immortals in my life after I won a happy smile competition). They are all here, creatures of a time before cool, in their Whitmont shirts and Raoul Merton shoes, laughing. Which is just as well, because this is a sad book about a man with a rare and fabulous talent who – because of this talent? Despite it? That’s the bone you come away gnawing over – ended up with a husk of a life. In a time worshipful of celebrities, few of whom possess a skerrick of Kennedy’s gift, it is a cautionary tale.